Every morning the young writer and myself have breakfast with the current neighbours. 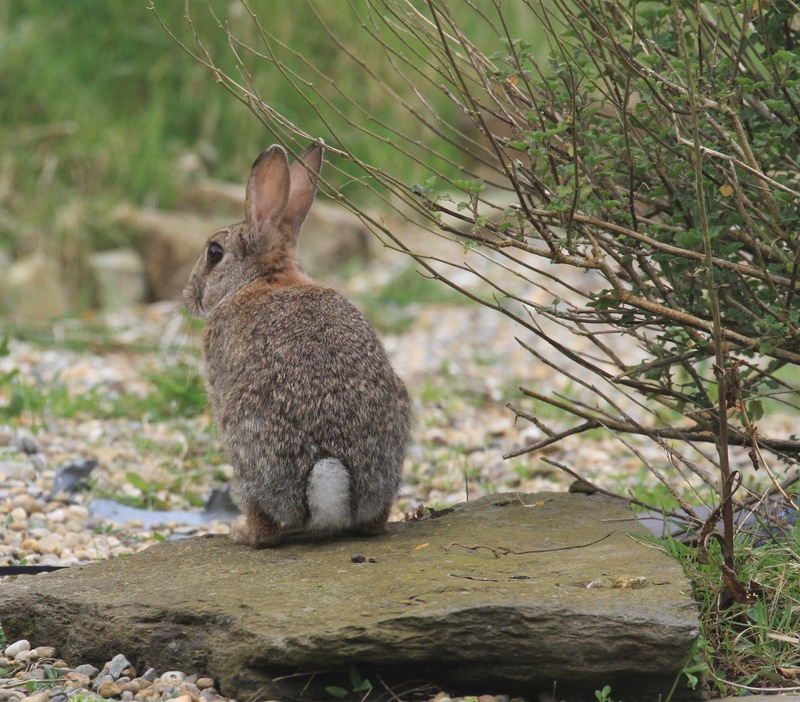 We enjoy watching the leveret, now weaned and left to his own devices. We used to joke about making a pet of him, especially my other half who secretly left carrots out for him!! Today the young writer remarked that he really is a pet already and you will see from his mid breakfast snooze that he is quite at home here in front of the kitchen window! 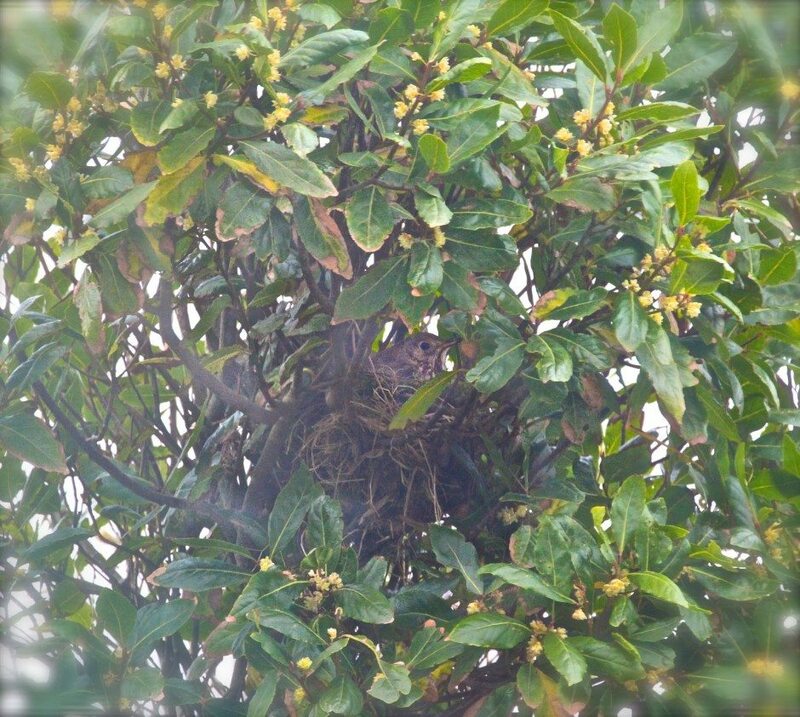 This morning was especially exciting as for the first time a pair of thrushes have taken up residence in our bay tree. We have been watching them setting up home, one stands guard while the other works hard flitting backwards and forwards…too fast to capture. Today I realised that I can see right into the nest. If I get down on the kitchen floor, and use my longest zoom lens I can see her outline just sitting there. This is the very first blurry photo taken just now…….look very closely…….. But sadly I have no time to linger and must get to work. Hopefully there will be more photos to follow! 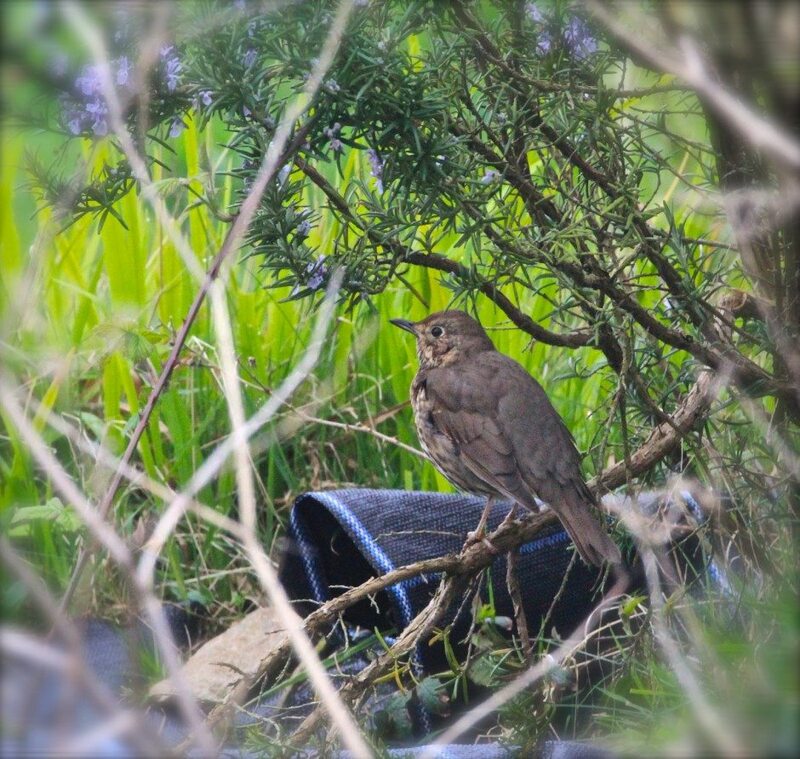 What a privilege to be able to join the hare and the thrush in their daily lives … lovely photos. What a treasure. Such a treat to be a witness to the wildness of life! Yes, the hare looks quite comfy! So far they are ok but I won't be putting out any young plants or greens this year….. I know Thea, I love hares too! They are special….. Thanks Philippa, I am entranced! I am a hare lover and at the moment it is spring we see them often in the field. Rabbits look so cute and your photos are lovely but a nuissance in my garden, there are two the last few weeks and they have eaten on a lot of plants. O I feel your pain Janneke! They're so cute! It's like a miracle, having breakfast in such a compagny. Mr hare really looks at home! I love your breakfast companions. Much better than the RAT which has started to raid our bird feeder! Don;t even mention Mr. Rat, he is where I draw the line!! Lovely pics, and your garden must be a peaceful oasis to tame such animals. If I had a decent camera (or really anything with a zoom lens) I would share some pics in return of our own new neighbors, a pair of black-capped chickadees who've set up home in a bird box on our shed wall. I've been painting the shed, and the birds have been hanging out on the the ladder steps when I'm using it. Not sure what they think of it leaning just in front of their bird-box; maybe it's a bit like being in a tree? However, I only have the camera on the phone right now, so you'll have to imagine it. 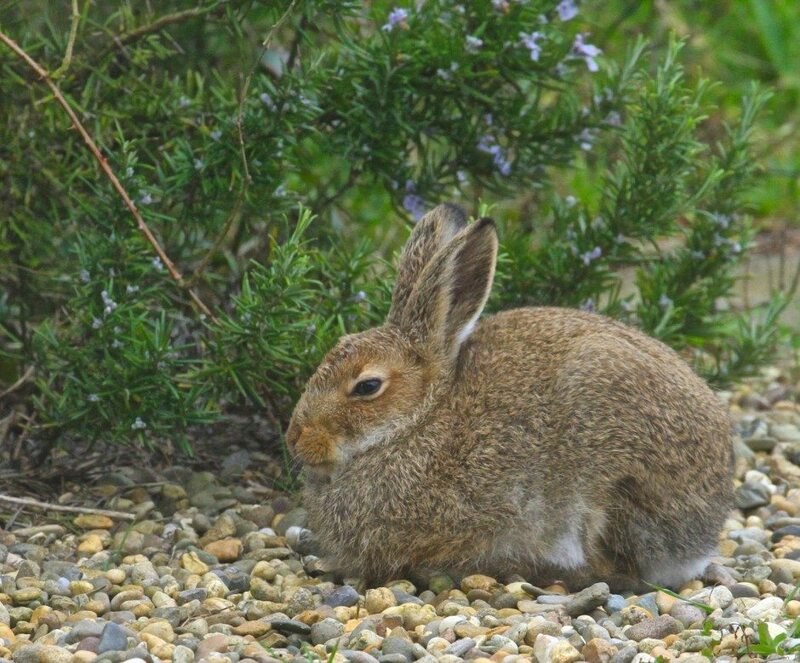 How nice to have a Rabbit in the garden, my dog would not be very pleased if we had one! But there is nothing better than watching the birds feed over breakfast.. I spend my mornings watching the antics of the birds fighting over prime nesting spots…only one big mama bunny so far but there will be young ones soon that will be squeezing through the fence…I can't wait.